Most people who play golf are aware of that moment when you arrive late for tee off, get flustered, bag flies out the car onto the trolley, falls off, back on, forget your shoes, wallet left in car, pay your subs, wanted to buy water, forget, back to car etc. etc…. you rush to the first tee with no warm up and top the ball into the rough, this is a common occurrence. Most relaxed and experienced Buckhorn players, aware of this folly, left more than enough time to get to Long Sutton, only to find that the A372 was apparently closed. As we did not have any women playing (who would obviously have followed advice) most of us refused to believe we could not get through. Three miles on and a very large Barber-Green, with an even larger Navvie driving it with a wry smile expressing ‘I told you so ‘ left us no choice but to reverse up sharply, turnabout, and take the recommended diversion via Bristol, Taunton and the Channel Islands. Now start again from the opening paragraph….. In fairness, the sun was shinning as if playing in Portugal, and the course had been repaired from the underwater experience in the winter. The owner happened to be in the clubhouse and showed us the most extraordinary photographs of the floods, remarkable in extent of damage and recovery. Basking in sunshine we had a glorious day. Robin sank the Putt of the season – 30 foot + , and also won Nearest the Pin, and Dave played out of his skin, or rather much better than Skin, as they ended either end of the leader board. Dave also won the Par 4 nearest in two, and his win now leaves him playing off 3, which is also a BWCC first. We have one last outing for this season at Ashley Wood on 13th October. The Club Championship were held as ever at Orchardleigh. 16 players started out in near perfect weather, and despite the odd monsoon drenching the greens and the players, we finished in near perfect weather also. The waterlogged conditions provided some interesting moments: Tim and Robin sheltering under a tree, whilst the second hardest man in golf, Nick Maynard, powered on brolly forward, undaunted to finish the hole. I say second hardest, as undoubtedly the hardest man was Ian, who seemed oblivious to the weather, but perhaps it was the pain of his broken toe that distracted him, a worthy winner of the craziest moment. John C and Phil had a long discussion on how to finish a hole, as they had no line in which to take relief, after careful debate they decided to award each other a two putt! Such common sense, rewriting the Ancient rules of golf. 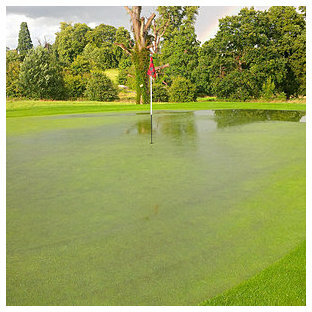 Chris narrowly avoided the water at one point, inches from the pond, only to hit his ball against the red marker delineating the hazard and sending the ball straight in to a watery grave. Dave Thomas kindly awarded a new prize for the best average score over the season, at least 3 scores to count. This was won by Alex Gibbs with 30, in second was Dave himself with 29.67. We retired to the Stapleton for a tasty bargain burger kindly laid on by Richard. Eleven of us picked a good day to play West Wilts, fine but breezy. Chris did mention how unusual it was to play every hole into a headwind, it certainly felt that way. This did not deter him from an excellent second place, despite the disadvantage of using a driver that was bought from the celebrity TV character Spongebob Squarepants, a remarkable feat. John Mac triumphed with 33 points, this Johns’ first win on the Buckhorn Tour, coming into form before the Major at Orchardleigh next month. Nearest the pin was Joe M, or possibly the only one to hit the green. There were two firsts that Monday, both worth a mention. John C had purchased a new automatic trolley, by automatic this obviously meant ‘a will of its own’ as John found trying to negotiate the car park. Fortunately he tamed it and had complete control by the end of the round. The other first, was warmly welcoming our new Landlord of the Stapleton Arms, Richard, who made two errors – telling me he played of 14 ( not lying through his his teeth as the rest of us would have done) and secondly going for a practice. We have all tried that with disastrous consequences. Another good turnout found Mendip golf course in great condition. 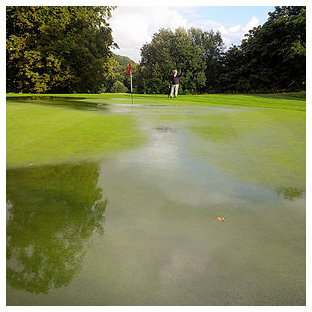 Nick was off with the early group who forgot to pay for their round, so dived in after 9 holes to remedy the situation. Thus the second group out had the rare sight of a figure in black running across the 9th green as they prepared their approaches. For those who remember the great Michael Johnson and his upright running style tearing up the 200 and 400 meter, Nicks action was very similar except not quite as quick. He then accompanied Ian and I to make an enjoyable 3 ball. Ian was having a little trouble with trees, and the third time I heard ‘ I can see a way through here – what do you think ?’ I felt bound to stay silent, not wishing to stifle invention. We had a good young turnout with George MacPherson out for the first time at BWCC Golf, looking very relaxed and even performing a trick shot. Managing the “table cloth trick'” with a golf ball – full swing under the ball and neither ball nor grass moving a jot. Very impressive. Cosmo Barron was also there although was having an issue with blood sugar levels (last day at Uni the day before) but came in an impressive third behind Robin in second. Alex had one of those rounds where it was hard to do anything wrong, ending winning the day and both nearest the pins, any golfer will tell you that you have to enjoy these rare moments, he will now have to play off 6 according to BWCC handicap rules. Sherborne was in great condition and as ever proved tough. Phil Bennett brought two guests, Andrew and George, who went off with Nick in the first group. We were delighted to have some guests and I would like to reiterate they are always very welcome. Nick had a fine nearest the pin on the 7th and George won overall with 32 points. The best score from the second four, was Alex with 29. We were also delighted to welcome back John ‘ Tourette’s ‘ Macpherson, who has obviously been taking new medication, because he struck the ball superbly from the Tee and there were no blasphemies worth mentioning until at least the 5th hole. Towards the end of the round we found ourselves being gently nudged from behind by a mixed foursome, who were playing a competition. Gentleman that we are, we asked them through, but they initially declined. At the 14th John found himself in the splendid multi coloured Rhodedendrons and Azaleas 30 yards from the tee, fortunately he found his ball, but a bad lie found him deeper in the pink and yellow splendour with his second, where the ball was lost. The rest of us had made the green by this time and turned to see the foursome watching with what I think was a wry smile, as John continued gardening, until giving up and walking down the centre of the fairway, but for the absence of white dungarees it could have been Augusta. At the next hole, the hallmark 15th, Ian smacked his ball 4 foot from the pin winning the second nearest the pin, and we sat on the bench to admire his shot and let the grateful foursome through. Thirteen Players started at Wells in glorious Spring sunshine proving one swallow doesn’t make a summer but they certainly know when it’s time to arrive. Predictably, adhering to the scriptures only 12 finished, but fortunately there was no crucifixion. Phil had to leave early for a meeting. Dave Thomas was outright winner playing off a handicap of 7, which was almost a miracle, certainly an outstanding round. Pete Cox finished on equal points and also nearest the pin on one of the short holes. John Carvel claimed the other nearest the pin, and whether this success prompted him to play out of a meter wide ditch as he walked on water I am not sure, but only his head and shoulders were visible, and I had to look away, so am unaware of the result. Once again Wells proved a very popular course and it was great to see Chris Davies and Tim Ovenden able to make it.